Summary: On Dec. 17, 1862, Foster’s expedition, aka Goldsboro Expedition or Foster's Raid, reached the railroad near Everettsville and began destroying the tracks north toward the Goldsboro Bridge (spelled Goldsborough at that time). Clingman's Brigade delayed the advance but was unable to prevent the destruction of the bridge. His mission accomplished, Foster returned to New Bern where he arrived on the 20th. 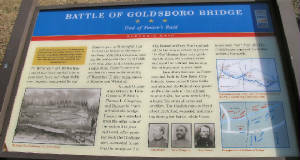 This battle was the high water mark of the Goldsboro Expedition. It was also important because it demonstrated that the Union forces had the ability to move from the North Carolina coast and push inland to the vital and strategic railroads at Goldsboro. Introduction: Union forces were under the command of Brig. Gen. John G. Foster. A West Point graduate, Foster was a veteran of the Mexican-American War and proven brigade commander during the recent Burnside Expedition. Confederate troops were commanded by Brig. 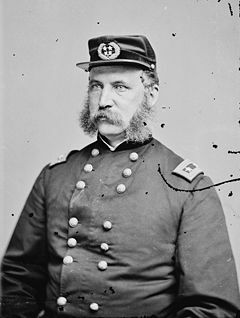 Gen. Thomas Lanier Clingman. A former U.S. Senator from North Carolina, Clingman was a lawyer, Fire-Eater, and one of the most outspoken politicians of his era. His proslavery stance and position on states' rights, including the following quote, were well-known to Congress: "Do us justice and we stand with you; attempt to trample on us and we separate!" He initially commanded the 25th North Carolina Infantry, a unit popularized in the movie Cold Mountain starring Jude Law as Private W. P. Inman (he really did exist). At General Lee's request, Clingman would later move his battle-hardened brigade into the thick of the fight at Cold Harbor, where the unit would engage in a fierce contest before routing the stubborn Federals. 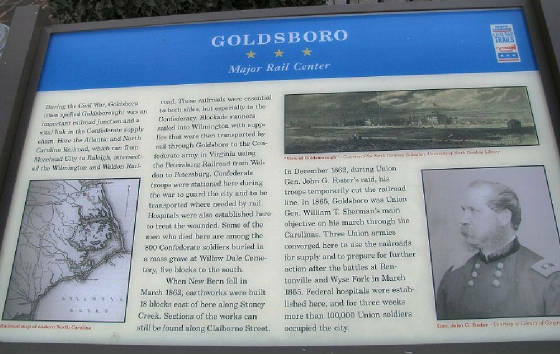 Goldsboro hosted a major rail line for the Confederacy. The goal of the Goldsboro Expedition was to capture the railroads in concert with Burnside's attack on General Lee at Fredericksburg in 1862. 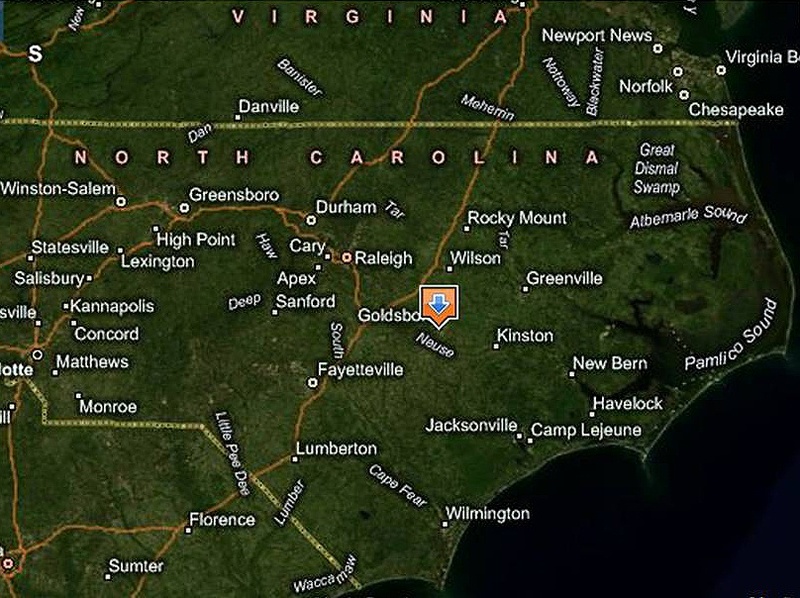 The Atlantic and North Carolina railroad intersected at Goldsboro with the Wilmington and Weldon railroad (the lifeline of General Lee's Army of Northern Virginia). Foster attacked Goldsboro in December 1862, burned the railroad bridge, but did not actually take the town. Upon burning the bridge, Foster and his troops left for New Bern. The railroad was halted, but only briefly, and enough of the bridge was left intact to repair. Background: The Battle of Goldsboro Bridge was contested December 17, 1862, at the Wilmington & Weldon Railroad Bridge across the Neuse River, three miles south of Goldsboro, North Carolina. Troops and supplies aboard trains from the Deep South and the port at Wilmington had to cross this bridge on their way to Virginia, making this bridge a vital link in the Confederate supply chain. Because of the intersection of two railroads at Goldsboro, the Wilmington & Weldon and the Atlantic & North Carolina, that city had become one of the most important railroad centers in the South. There were other railroad bridges and depots between Wilmington and Virginia, but the presence of the two railroads at Goldsboro, with the fact that Goldsboro was only 60 miles from Union-occupied New Bern, made the railroad bridge at Goldsboro an important objective for the Union War Department. Union commanders believed that the destruction of this bridge would impact the ability of the Confederacy to wage war, if completed in conjunction with a major Union victory in Virginia. A defeated Confederate army, denied re-supply, could be swept aside, leaving the Confederate capital at Richmond vulnerable. The time to implement this plan arrived late in 1862. In December, the commander of the Union Army of the Potomac, General Ambrose E. Burnside, was planning an attack on General Robert E. Lee's Army of Northern Virginia at Fredericksburg, Virginia. Plans were developed for the Union commander in North Carolina, General John G. Foster, to simultaneously launch an attack from New Bern against the railroad bridge at Goldsboro. This expedition has come to be known as Foster’s Raid. Battle: On the morning of December 11, 1862, General Foster marched from New Bern with a force of 10,000 infantry, 640 cavalry and 40 guns. 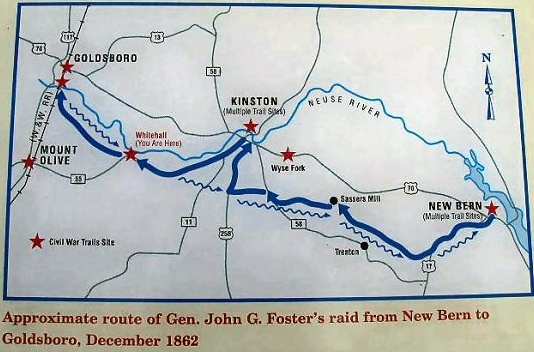 After meeting and defeating small Confederate forces at Southwest Creek, Kinston and White Hall, Foster’s army arrived at the railroad bridge south of Goldsboro on the morning of December 17. Foster deployed his troops and artillery and they began to fight their way to the bridge. (Right) Foster, Clingman, and Evans. Principal figures at Goldsboro Bridge. The bridge was defended by General Thomas Clingman, who commanded a small force of some 2,000 men and a dozen guns. The Confederates fought valiantly but were repulsed east of the railroad and to the north bank of the Neuse River. After a two hour battle, a daring assault party of Union volunteers, supported by artillery fire, rushed forward amidst a hail of bullets and set fire to the bridge. Union artillery subsequently fired on the burning bridge, to aid in its destruction and to foil Confederate attempts to douse the flames. 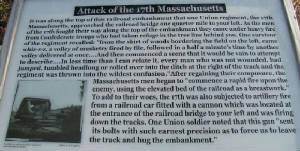 In a short while the bridge was destroyed, and then Union troops further damaged the railroad by destroying the tracks for a distance of two to three miles south from the bridge. The sound of the Confederate attack attracted the attention of Union troops that had just left the field and before the North Carolinians could reach the Federal position, additional Union soldiers and guns had rushed back onto the field. In a short time the Union command had grown into two infantry brigades and three batteries of artillery and the odds were suddenly against the Confederate attackers. When within 100 yards of the Union line the Confederates were met with musketry and double canister fire from up to eighteen Federal guns, and the Confederates were turned back with heavy losses. Clingman’s other two units, the 8th and 61st North Carolina, were now in position but wisely did not cross the railroad, and instead engaged Union forces from behind the embankment. It was now quite late and as darkness descended on the battlefield the firing died down. 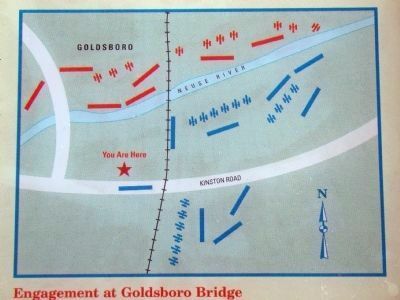 The Battle of Goldsboro Bridge concluded with nearly 250 men killed, wounded and missing. Foster’s army once more turned to leave the field but was slowed by having to cross the freezing waters of a swollen stream--which flowed behind the Union positions. During their counterattack, Rebel soldiers had destroyed the dam on a millpond through which the stream flowed in an effort to trap the Yankee rear guard. Now Union soldiers were compelled to cross the rapidly rushing stream, which was up to their necks. After crossing the stream, the soaked soldiers set fire to the woods on both sides of their line of march, to warm themselves and light their way in the darkness. The Union army returned to New Bern just before Christmas 1862. They left in their wake a torn and broken landscape, and 1,300 combined Union and Confederate casualties. Results: Foster’s Raid was a tactical success for the Union. The vital railroad bridge near Goldsboro was destroyed, temporarily halting the flow of supplies from the Deep South and the port at Wilmington to Virginia. Clingman, hearing of a possible censure by State legislatures for his failure to prevent the burning, wrote to Gov. Zeb Vance, January 28, 1863, saying, "It is said that the troops in the vicinity of Goldsboro ought to have prevented the loss of the bridge & the damage done to the railroad. This is undoubtedly true. 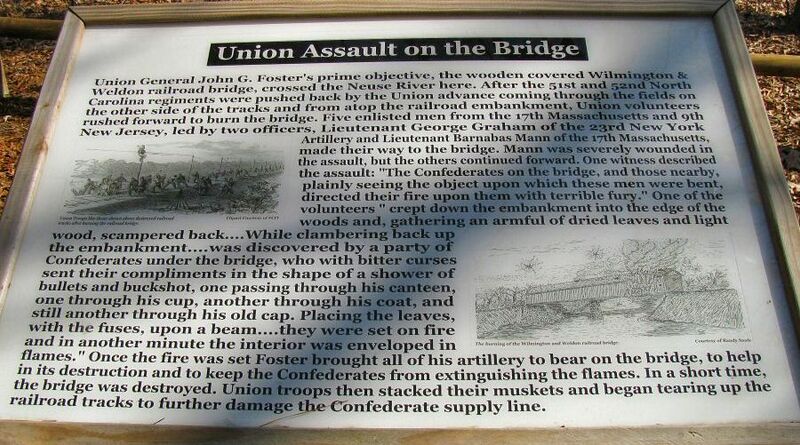 You are aware, as well as I am, for we had a conversation on the day following that at least six hours before the bridge was burnt, there was a brigade in Goldsboro, & within three miles of the railroad bridge. Had these troops not to speak of others there present, been moved to my support, I cannot permit myself to doubt, but that we should have defended the bridge." The success Foster enjoyed at Goldsboro was muted, however, by events in Virginia. Burnside’s attack against Lee at Fredericksburg was a disaster for the Union (which was soundly defeated). The triumphant Confederate army in Virginia was thus able to withstand a temporary loss of supplies and reinforcements from the South, nullifying what would have otherwise been a major strategic victory for the Union. 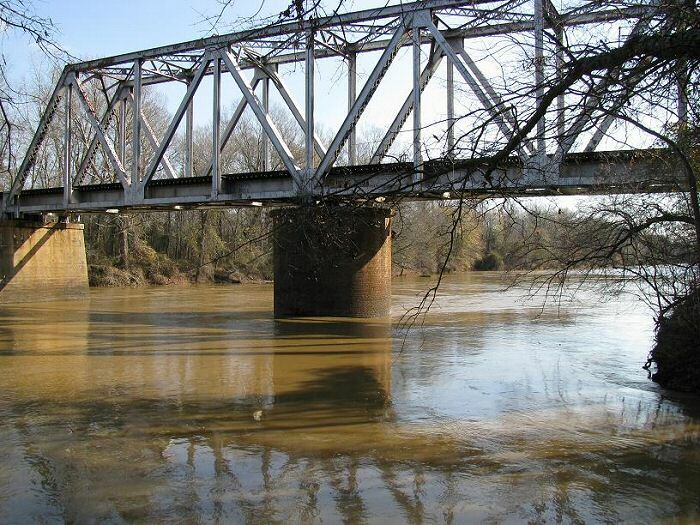 Because of the importance of the Goldsboro Bridge to the Confederate chain of supply, men and engineers were rushed to the site and the bridge was rebuilt in a matter of weeks. The next time the Union army would get so close to Goldsboro was on March 21, 1865, when three Union armies over 100,000 strong, captured the city and its vital railroad bridge and depots. These Union armies, commanded by Generals William T. Sherman, Alfred Terry and John Schofield, used the railroads at Goldsboro to re-supply for a final push on the state capital at Raleigh, which was to be followed by a link-up with General U. S. Grant’s army in Virginia. The three armies left Goldsboro on April 10, 1865; just one day after General Robert E. Lee surrendered to Grant at Appomattox Court House, Virginia. Sources: National Park Service; goldsboroughbridge.com; Official Records of the Union and Confederate Armies; National Archives; Library of Congress; Zebulon Baird Vance Papers, Private Collections, State Archives of North Carolina. It was, he finds, tapping hitherto unused sources, absolutely essential, affording the South a virtual lifeline of military necessities until the war's last days. This book covers it all: from cargoes to ship outfitting, from individuals and companies to financing at both ends. An indispensable addition to Civil War literature.